The Chairman’s Luncheon, 29 April 2017 | The International Cricket Hall of Fame. You are invited to secure a seat at the annual end of season luncheon which will be held in the main hall of the Museum on Saturday 29 April 2017. A highlight of the lunch program will be MC Mike Coward conducting a Q & A session with the soon to be announced 2017 Bradman Scholar. So please join us for an autumn day’s fine dining, good conversation and spirited cricket. Their will be a special announcement of the partnership between the Bradman Foundation and Kollege of Knowledge for Kids (KKKK). Contact Renee Mathewson at [email protected] or phone 02 4861 5422. On the oval the now traditional Chairman’s Cricket Match will be taking place from 10.30am and the players will join guests for lunch. 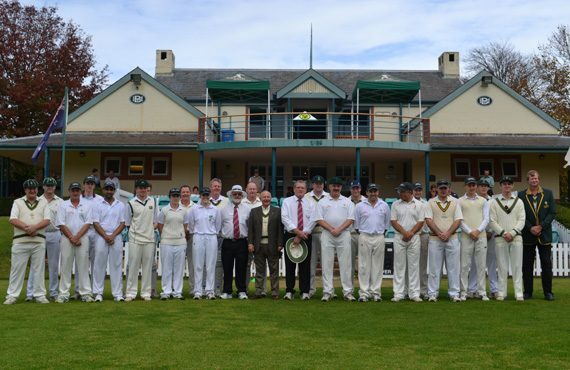 The match is a social occasion which marks the end of the cricket season on Bradman Oval. The teams comprise mix of past and present Bradman Scholars, Crest Members, Sponsors, talented local juniors and invited guests. The match is keenly contested and is always played in the best of spirit.